Hot chocolate’s pretty jazzy as it is, but as the holiday season is in full swing, why not take your hot cocoa game to the next level? Check out these fancy tips for jazzing up your hot chocolate this year — trust us, you won’t regret it! Let’s get right down to it. Marshmallows are literally the best friends of hot chocolate. But to make things a little fancier with your marshmallows, we recommend trying homemade marshmallows. A number of recipes can be found online, but basically, you’ll be mixing together sugar, corn syrup, gelatin, salt and vanilla for a scrumptious marshmallow that will make you never want to go back to store-bought! Who says hot cocoa can’t be spicy? For the sweeter side, we recommend topping your warm hot chocolate goodness with some cinnamon or nutmeg, but you can also try something legitimately spicy — cayenne or chili powder, for example. Naturally, when it comes to hot chocolate, whipped cream is the perfect pairing. But what about popping in a little crunch with that creamy softness? Try a few pieces of broken pretzels for a crunch that’s also salty. If you’re not a fan of the sweet and salty mixture, however, try a few crumbles of gingerbread cookies or gingersnaps for a festive and sweet crunch. Of course, we’re talking alcohol in moderation and only for responsible adults. If you fit the bill, a few drops of booze can be a great way to spice up a regular cup of hot cocoa. We recommend Baileys or a delicious amaretto. Can you ever have enough chocolate? We don’t think so! Extra chocolate can be added to your hot cocoa in a number of ways. For example, shave some solid bar chocolate onto your whipped cream, try chocolate sprinkles, or warm up some hot chocolate sauce and drizzle it on top! 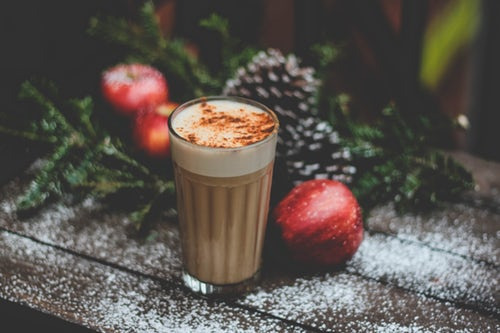 This holiday season, wouldn’t it be nice to celebrate with a delicious cup of jazzed-up hot cocoa in your very own Plano apartment? Our apartments in Plano, Texas are waiting just for you! Please contact us to see what floor plans are still available.